Mitochondria are discussed like they are understood, but most people don’t know really what they are. In reality, most students of biology and medical doctors are the only people who understand how mitochondria work, what can make them “sick”, and how to make them work optimally. Simply mitochondria is known as “breath for the cell” They take sugar and make energy and CO2 (carbon dioxide) and water H2O. Mitochondria are the tiny determiners of our ability to metabolize food and make the energy a cell needs to do its job effectively. To locate our mitochondria, we must take a microscope to the human body, and successively dissect her into smaller and smaller parts: A whole human body, divided into organ systems e.g. Skin, Gastrointestinal system, then divided into smaller parts called tissues such as muscles and neuro-tissue. Smaller still are the specialized cells that make up the tissues, call cells. Smaller still are the mitochondria that are located within each cell in the body, providing energy to the cell, to make the whole-body work! 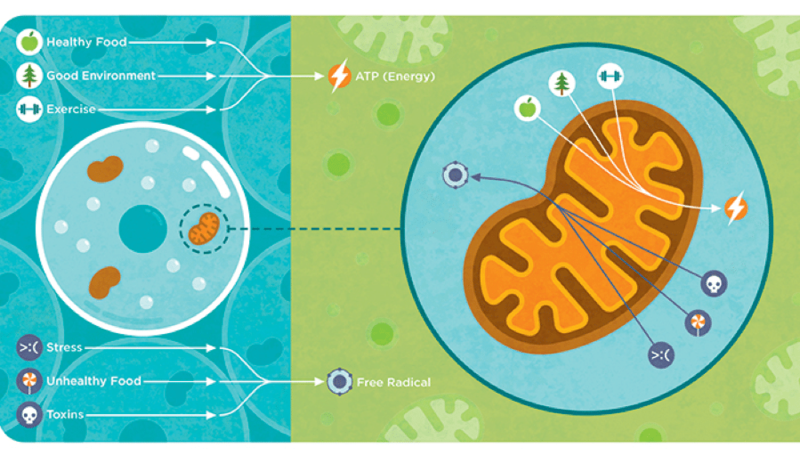 Mitochondria are small, oval, sub-cellular “ energy packs” located inside every cell in our bodies. These small organelles within our cells turn sugar (glucose) from our food, into ATP (energy) and Carbon Dioxide (CO2). They act like miniature lungs, taking in sugar which is made of oxygen and carbon, and returning CO2 as a by-product. Scientists say that mitochondria’s activity is “respiration”! The CO2 passes out of the cell and is excreted by the lungs. So why do we use Mitochondria as a catchword for a way to sway lay people to buy a product to keep them healthy? It is a way to explain complicated physiology to people who aren’t trained in a particular science like medicine or biology, and a way to sell products. The word mitochondria is associated with sickness and how to get better and it becomes a catch word everyone knows and wants to “fix”. However, if it is a fad or an advertising method to sell something, knowledge of what mitochondria need to make energy, is a valid pursuit. In short, your cells need plenty of oxygen, healthy foods, exercise and a clean environment to make energy effectively in your mitochondria. 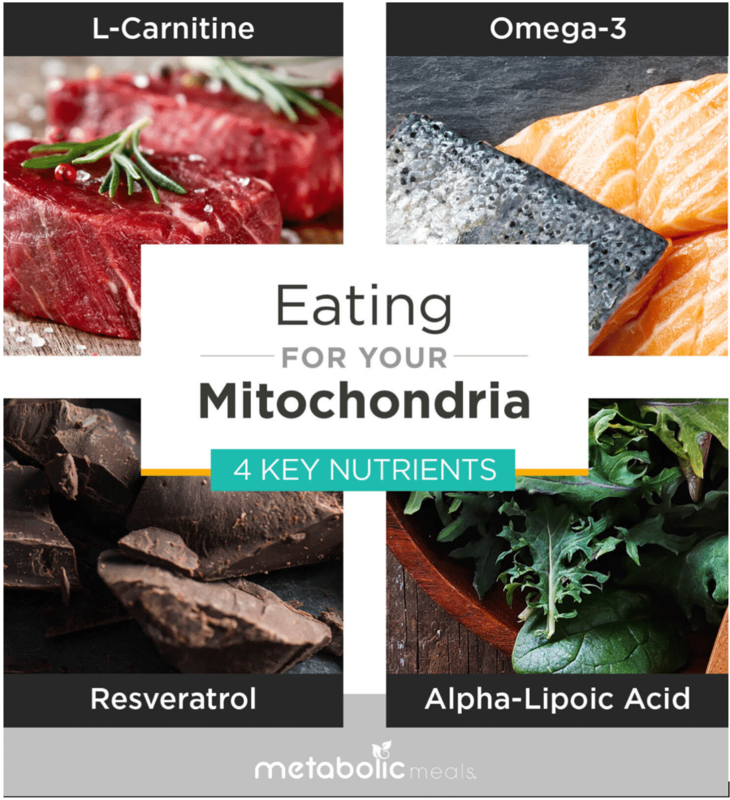 Because our food source does not have adequate nutrition for us and our mitochondria, we must eat foods that are particularly packed with nutrients and or we must add supplements such as resveratrol, Alpha-Lipoic Acid, L-carnitine and omega 3 oils to heal our “sick mitochondria”.